When Bob Dylan released his thirtieth studio album in 1997, critics claimed that the ominous atmosphere created by producer Daniel Lanois was palpable, but also almost drowned the singer’s vocals. It’s interesting then that New York-based director Oren Moverman – who co-wrote Todd Haynes’ Dylan pseudo-biopic I’m Not There (2007), as well as helming dramas The Messenger and Rampart – chooses to use the same title for his film concerning a homeless man adrift and voiceless in New York. 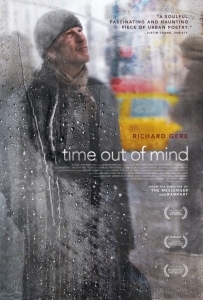 Time Out of Mind (2014) is the director’s third feature and the latest in an ongoing exploration of institutional failure – this time, in supporting those members of society who can’t support themselves. Richard Gere plays brilliantly against type as George, the long-term homeless man upon whom the focus falls. When he awakes dazed and confused in a bathtub in the opening moments, it is immediately clear that all is not well. Throughout the following several days that the film spans, he sleeps little but when he does, he wakes up with a start, blinking and disorientated. In between he trudges the streets; usually ignored, sometimes moved along, muttering about someone named Sheila. A few nights are spent in a refuge, but bureaucracy seems determined to prevent him from securing a permanent bed. It eventually transpires that he has a daughter (rising star Jena Malone) but they are clearly estranged and he occasionally watches her from a distance, forlornly. It’s from a distance that the film observes him too. Moverman and his regular cinematographer Bobby Bukowski conjure a tangible sense of George’s isolation through their visual language – always shooting through windows or from across the street. It’s not a technique that distances him from the audience so much as it disconnects him from the people around him while simultaneously intensifying his envelopment by the cityscape around him. Often free of dialogue, we nonetheless hear the clinking of cups and the general chatter of the patrons of a coffee shop as we observe George out on the sidewalk. George’s invisibility is really the central theme here and Gere does a fantastic job of embodying this broken man. Taciturn at best and always difficult, he exists in a constant state of distraction and denial that form the backbone of the character study that replaces traditional narrative. The trademark twinkle is notably absent from the eye as this man both loathes himself and laments his luck without ever truly accepting his situation, repeatedly claiming to just be “between things” at the moment. It’s an incredibly moving performance that lends Time Out of Mind emotional weight and anchors this contemplation of a man adrift in a world that doesn’t appear to care.